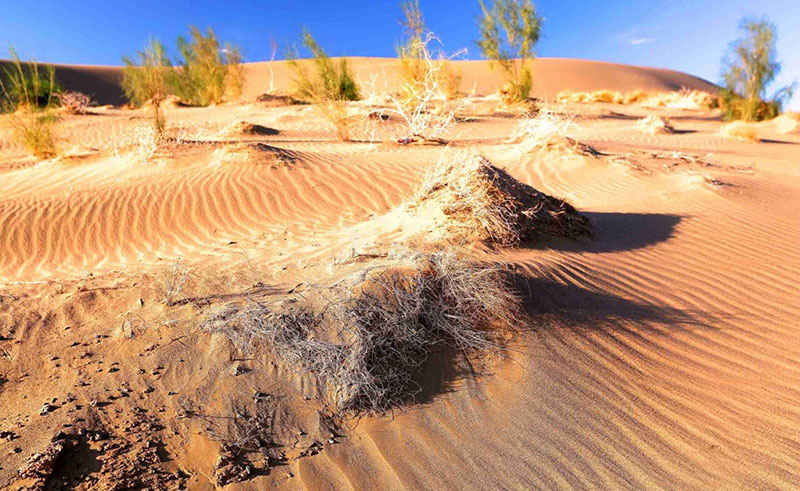 Biologists from the Key Laboratory of Biogeography and Bioresources in Arid Lands, Xinjiang Institute of Ecology and Geography in far north-western China, have been studying biological soil crusts typical of the deserts of this region for more than a decade. An invitation to join a Chinese-led, international team of palaeontologists studying crinoids in marginal desert lands of north-western Xinjiang led also to an unexpected invitation to work with Chinese scientists on soil crust biology of the Gurbantünggüt Desert. Gurbantünggüt Desert, Photo: Wang Ao. Understanding the biology of desert soil crusts can provide useful tools for the management of arid lands where soil crusts play a major role in minimizing erosional processes and in doing so, reducing sandstorm frequency and the associated costs of adding to pollution in the major cities and towns of eastern China. Alison Downing is a Senior Research Fellow in Biological Sciences at Macquarie University. She completed her Masters degree on karst bryophytes in 1993 and continued with that work and other allied interests, such as Pottiaceae and bryophytes of biological soil crusts, ever since. Besides her collaboration with Chinese researchers on desert soil crusts she also is working on subantarctic bryophytes, at the other end of the world. Current projects include the role of bryophytes in determining strategies for the long term management of subtropical rainforests in eastern Australia. At a time when academic staff at universities around the world are more and more frustrated by increasing administrative work, her present position allows Alison greater opportunities to facilitate local and international collaborative studies. She also likes promoting bryology to the general public to overcome many of the less favourable preconceptions about bryophytes. 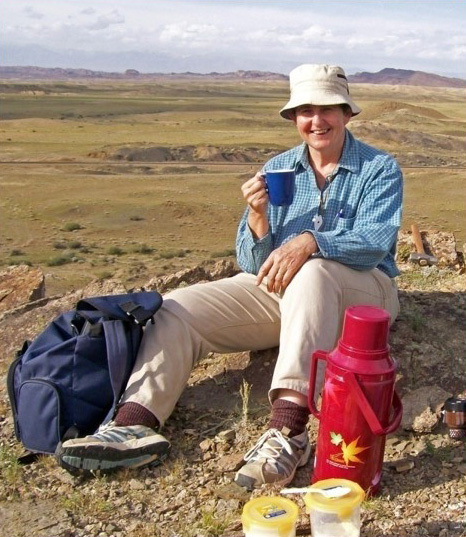 Alison is a Council Member of the International Association of Bryologists. This entry was posted in It’s All About the Plants on 15 July, 2016 by Jürgen. Cyanthus olla with “eggs”. Photo: Bob Baldock. State Herbarium Hon. Research Associates Pam Catcheside and Bob Baldock report another cryptic and appealing fungus. It has appeared in the Botanic Gardens, this time amongst bark chips associated with recent plantings of pistachio saplings adjacent to the Old Tram Barn. A previous BLOG article described the coral fungus, Aseroe rubra Labill. It is a birds nest fungus, easily passed over by the casual visitor to the gardens, but worth close inspection. Its Latin name, Cyathus olla (Batsch) Pers., literally means “cup” and “pot”. The bulk of the fungus occurs as cryptic, microscopic threads (the mycelium), infiltrating and busily dissolving the wood and bark chips for food. But the mature fruiting body is visible to the keen observer. Cyanthus olla. Photo: Bob Baldock. At first a ball-shaped structure forms. 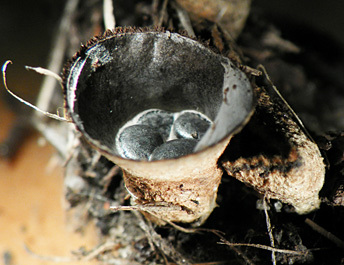 Then the membranous top tears to reveal a hollow interior with 8 to 10 grey-black “eggs” at the bottom of a fruiting body about 10 mm across which becomes goblet-shaped. The outside is grey-brown, covered with fine hairs at first, but it may later become smooth. Each “egg” is a spore packet a mere 3-5 mm by 1-2 mm, attached to the sides of the cup by fine elastic threads (unfortunately not visible in the images provided). At this minute scale, raindrops falling inside the “nest” have enough force to fling the “eggs” and their threads up and 1 m away from the fruiting body − a small-scale but violent dispersal mechanism! The elastic threads act like the boluses of South American gauchos and wrap around any available obstruction as the “eggs” land, securing them in place. Cyanthus striatus. Photo: David Catcheside. 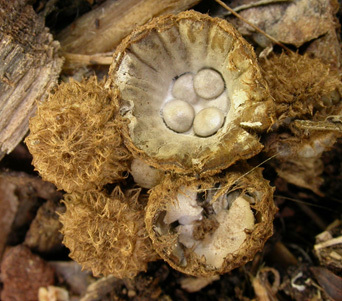 The fluted birds nest fungus, Cyathus striatus (Huds.) Willd., also appears occasionally on wood mulch in the Botanic Gardens. 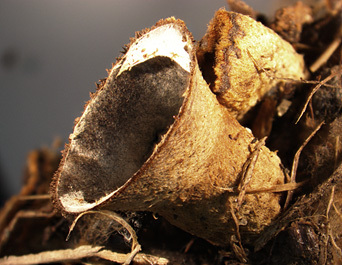 The cups are similar in size to those of C. olla but their outer surfaces are covered with brown, shaggy hairs, and the inner surfaces are grooved or fluted, hence the name striatus. Other birds nest fungi, Nidularia and Crucibulum species, lack elastic threads and have their “eggs” embedded in mucilage, but like Cyathus, rely on raindrops for dispersal. This entry was posted in It’s All About the Plants, News on 10 June, 2016 by Jürgen. Dr James’ research interests focus on the diversity and biogeography of the flora of the Pacific region. 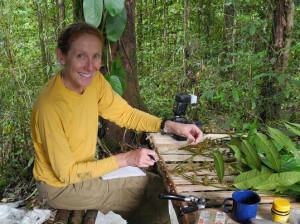 For more than six years, she has been undertaking field work in Papua New Guinea and, recently, the Solomon Islands, collecting new botanical specimens in remote locations, and digitising herbarium collections from the Pacific. Now working for iDigBio (Integrated Digitized Biocollections), the US initiative mobilising biological specimen data, she liaises between museum collections staff, researchers, educators and cyberinfrastructure to promote the use of natural history collections and the data they contain in answering big science questions. Previously, Shelley was a botanist in the Herbarium Pacificum and manager of the Pacific Center of Molecular Biodiversity at the Bishop Museum in Honolulu, Hawai’i. All Herbarium staff, honoraries, volunteers, students and guests welcome. Morning tea provided. This entry was posted in It’s All About the Plants on 25 February, 2016 by Ainsley. Turning sand dunes into salt marshes on Torrens Island. What happened then and how does it look 25 years later. Doug is the newly appointed Hon. Research Associate of the State Herbarium of South Australia and will speak about his involvement with the restoration of the vegetation of the island and his recent visit in Aug. 2015. This entry was posted in It’s All About the Plants on 28 October, 2015 by Jürgen. Please note that the next It’s All About The Plants seminar has been postponed until next month. On Tuesday, 3 November Doug Fotheringham (our newest State Herbarium Honorary Research Associate) will give a presentation.